Dinosauromorpha: Lagerpeton + *: Lagosuchidae + (Silesauridae + Dinosauria). shortened forelimbs; $ at least partially perforated acetabulum (?? ); enlarged supraacetabular ridge; primitively, acetabulum remained relatively large compared to femoral head; $ antitrochanter on posterior wall of acetabulum (primitively small); $ extension of femoral articular surface under head of femur (? ); $ proximal femur with fossa trochanterica and trochanteric shelf; $ anterior lesser) trochanter on femur; $ trochanteric shelf on proximal femur; $ cnemial crest present on proximal tibia; $ quadrangular distal tibia with lateral longitudinal groove; $ posterior flange on the distal end of tibia. Links: Untitled Document; Dinosaur Monophyly; Dinosaurian Precursors. Hutchinson & Gatesy (2000); Novas (1996); Sereno & Arcucci (1994). Phylogeny: Dinosauriformes: (Dinosauria + Silesauridae) + *. Characters:Small (<0.5m), gracile, bipedal proto-dinosaurs. Elongated snout with numerous, small teeth; long, S-shaped neck; vertebrae sharply regionalized (i.e. cervical, ant. dorsal, post. dorsal, & caudal); spines of dorsal vertebrae may incline anteriorly (said to be associated with saltatorial habit); acetabular fenestration minor or absent; posterior limbs much longer than anterior; tibia longer than femur; head of femur points toward midline, but femur may be somewhat sigmoid (Lagerpeton); fibula reduced sharply, limiting rotation at knee; calcaneum reduced relative to astragalus; calcaneal heel absent; dinosaur-like mesotarsal hinge between astragalus & calcaneum and between proximal and distal tarsals; but proximal tarsals not integrated with crus; metatarsals II-IV very long & closely appressed; 5th digit not hooked; fully erect posture; very likely obligate bipeds; may have line of dorsal scutes. Marasuchus lilloensis © 1999 by SH Morgan. Used by permission. 1) elongation and fusion of the phalanges (toe bones) and metatarsals (foot bones). Here, the toes and metatarsals are quite long, but there is no evidence of fusion. 2) hind limbs 2-4 times as long as front limbs. Lagosuchids are marginal. 3) center of gravity shifted posteriorly. Its hard to tell from skeletal remains alone. Perhaps the answer is "somewhat." The pelvis, in particular, suggests a design which maximizes the amount of posterior mass. However, this is not nearly the same degree of back-heaviness seen in a frog, rabbit, or kangaroo. 4) small head or stiffened or fused cervical spine. The head is not well known for any lagosuchid. 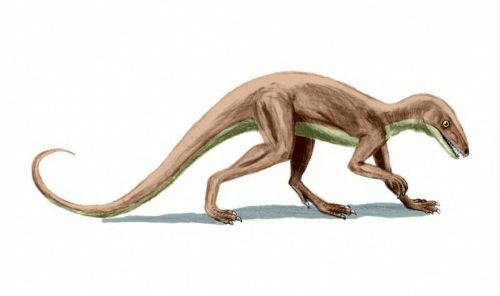 Marasuchus, at least seems to have had a relatively small head and the cervical vertebrae are notably longer and deeper than the dorsal vertebrae, suggesting that the neck was less laterally flexible and may have been tightly bound with tendons. This impression is reinforced (as was the neck) by the presence of fairly long cervical ribs. Links: DinoData: Lagosuchidae; dinosauromorpha; Dinosaurian Precursors; Marasuchus -- The Dinosauricon. Arcucci 1997); Carroll 1988); Garner et al. (1999); Padian 1997).